The first time I ever had a dessert like this I was in the Midwest and it was made with blueberries instead. It was referred to as “Blueberry Delight” and I remember being a bit blown away by such a simple dessert. 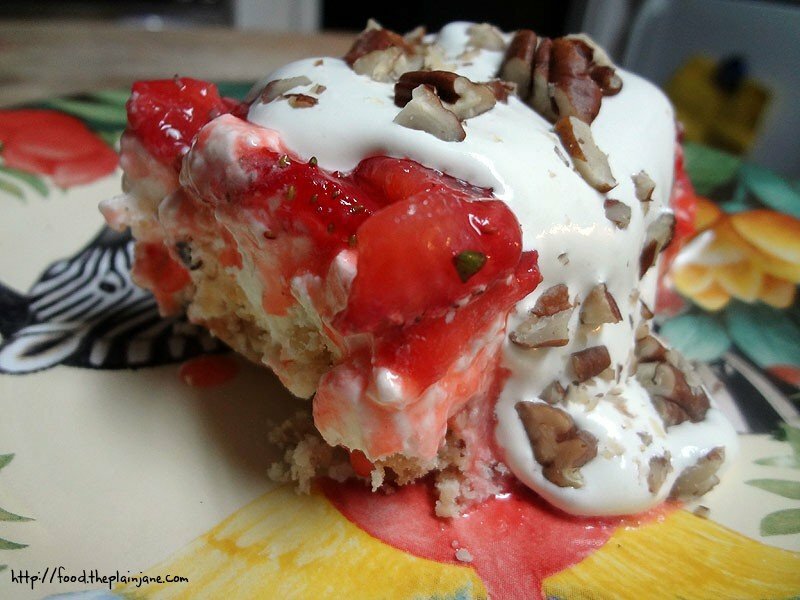 This is a layered dessert, something very well known in the South but I had never had it out here in California before… It’s got a cookie-like crust, a sweet cream cheese layer, your fruit, and then whipped cream or whipped topping and nuts to top it all off. It’s simple, easy to make, and deliciously creamy. I had picked up a fresh basket of locally grown strawberries and I thought, “Well, I bet I can turn Blueberry Delight into Strawberry Delight!”. Any mixture of berries will do for this dessert, really, and I think fresher is better for this one. The dessert starts to look kind of droopy after a day or two, so it’s best to try and gobble this one up quick and all leftovers need to go into the fridge. I picked up these beautiful strawberries at The Fruit Stand off Morena Blvd. They had some fine looking fruits and I could not resist getting this basket. To prep, I just washed the strawberries and sliced them. 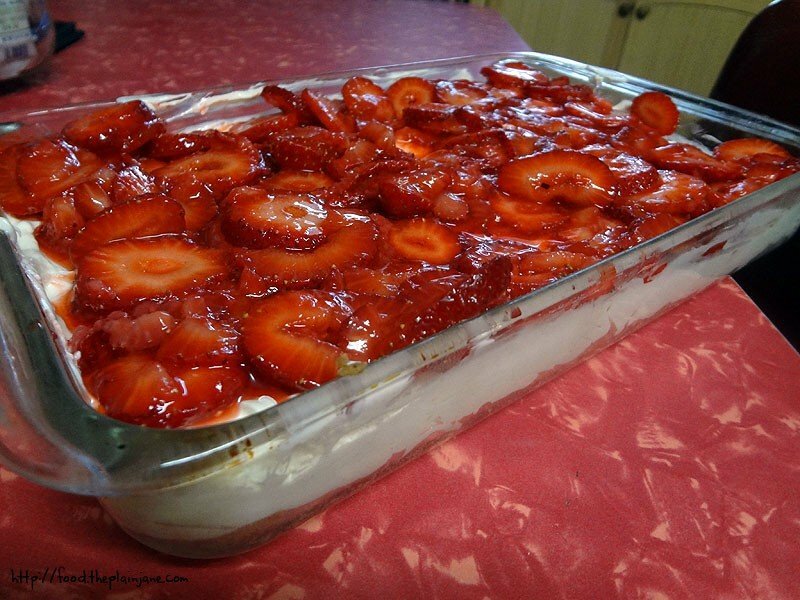 I added about two tablespoons of sugar to macerate the strawberries. After finishing the berries, I prepped the crust. 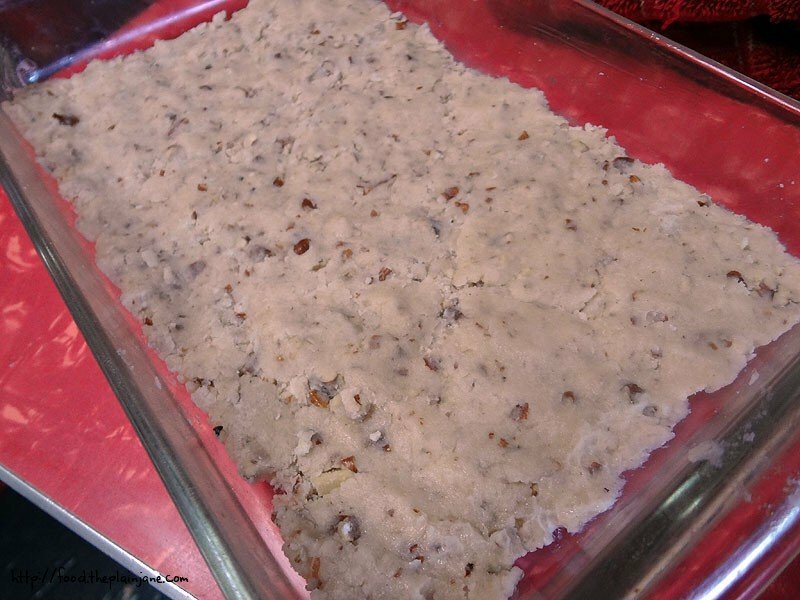 It’s a very simple mixture of flour, sugar, pecans and softened butter. The mixture comes together quickly and spreads out easily in the pan. I pushed it with my fingers to spread the crust out evenly. This is the only thing you’ve got the bake! 15 minutes and you’re done. This is also something you should do ahead since a cooled crust is necessary. This crust seriously tastes like those pecan sandies cookies they sell in the store. I forgotten to tell Jake to leave the whipped topping out for me on the counter, so when I realized that my topping was still frozen I grimaced a little and then figured I’d try this. The crust had just come out of the oven so I put the two tubs on top of the crust. Hey, it sort of worked! It did at least speed up the process a little bit so I was able to work with it to make my sweet cream cheese layer. The sweetened cream cheese goes right on top of the coolest crust. Which gets topped with the macerated strawberries! At this point I stick the whole thing in the fridge to set and cool down completely for a couple of hours. I don’t add the whipped topping until I’m ready to eat it, because the whipped topping usually gets sad looking after awhile. But! If you’re making this for a party or a dinner or something, I’d totally put it on sooner. It’s pretty, after all. Here’s a slice with the whipped topping and extra pecans in the mix. Mmm. I hope you make this before the summer’s out! 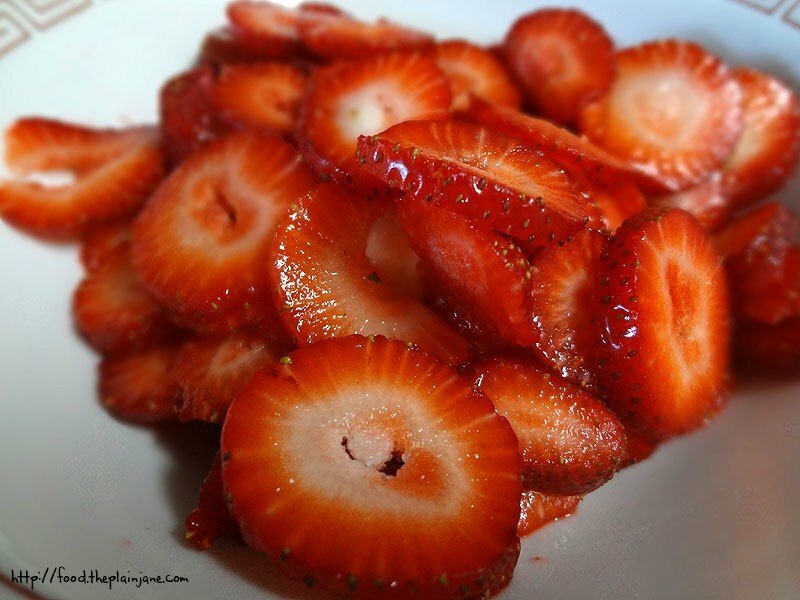 Wash and slice your strawberries. Add a few tablespoons of sugar to the cut strawberries to macerate them. Toss and mix in the sugar and set aside. Preheat your oven to 350 degrees. Combined all ingredients together for the crust – using softened or almost melted butter will ease the mixing process and help you to spread the crust into a 9 x 13 pan. Bake until golden brown, about 20 minutes. Let cool. 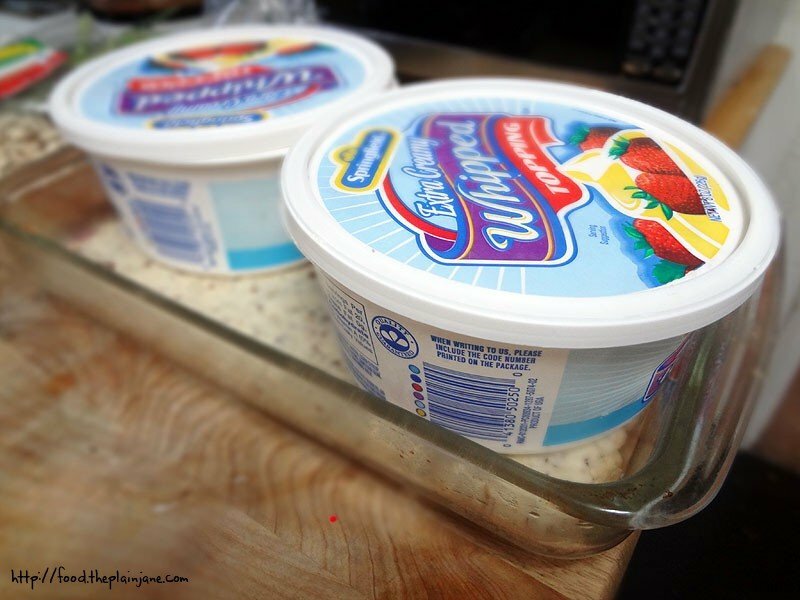 Cream together your cream cheese and butter in a bowl. Add powdered sugar, a cup a time, until well incorporated. Add vanilla. 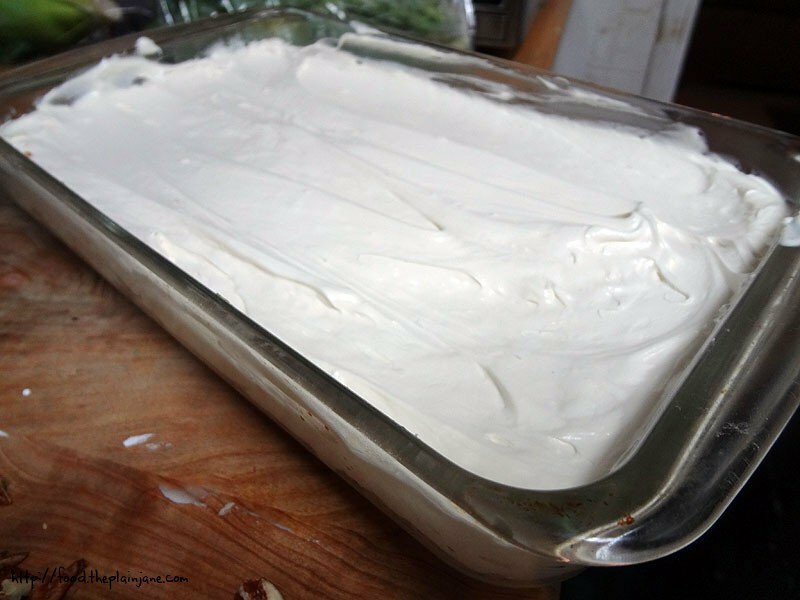 Add 8 ounces (or half a tub of the large tub of whipped topping) to the mixture and gently fold it together. Spread on cooled crust. Pop into the fridge for 2-3 hours (or overnight). When ready to serve, top with reserved whipped topping and chopped pecans. It look marvelous and I imagine all the ingredients — my favorite ones too — work well together. Ohhhhhh!! I had that in Ohio many moons ago and never had a recipe. Yours looks superb and then some. Yum!! Hi Jenny – Thank you! It took me awhile to remember what the name of the dessert was to even find a recipe online. Ahh, the Midwest and their luscious desserts!